The market capitalization of the Little Fruit Company has now passed that of Google. That makes them the second largest valued company in the world, behind Microsoft. Not that things couldn't change. Life is filled constantly with change, for chaos is the order of the universe. I'm famous/infamous among my friends for saying: "Evolve or die." Apple has clearly been a student of this philosophy. From a niche computer maker to worldwide commercial electronics maker in less than a decade. Perhaps Microsoft really isn't the nemesis, but Sony is? What the world holds for its future, who knows, but it certainly looks bright right now. Doesn't it? By market capitalization there are 3 companies more highly valued than Microsoft: Exxon Mobil, China Mobile, and Petrochina. But the general point stands. 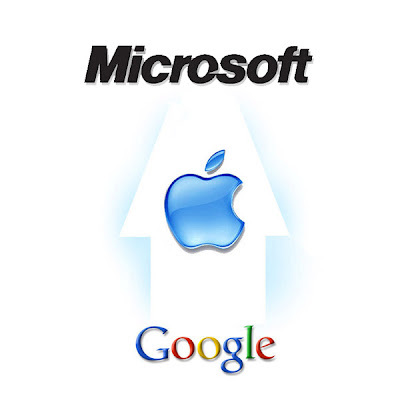 Lets all hope Google's more open philosophy and technologies (Android, gOS) someday trump the secretive and backward ways of both Microsoft & Apple. A world where computing platforms are closed is a world we should all be very afraid of. Both Microsoft and Apple have done quite a bit recently to hurt developers, consumers, and innovation. Neither has my trust, confidence, or support. "life is filled with constantly with change for chaos is the order of the universe." Let's remove some of the words, and add some punctuation, and then maybe you'll have a sentence. There's even more people ending their love affair with Apple (NSDQ: AAPL). In this chapter, Jason Calacanis, the CEO of Mahalo.com, a human powered search engine, breaks down his reasons in five parts. In his controversial post, he summarizes: "Apple will face a user revolt in the coming years based upon Microsoft (NSDQ: MSFT), Google (NSDQ: GOOG) and other yet-to-be-formed companies, undercutting their core markets with cheap, stable and open devices. Apple's legendary comeback ability will be for naught if they don't deeply examine their anti-competitive nature.